The first week back from vacation was difficult. We weren’t at the beach, for one thing, and it was very hot. The temperature never broke 100 degrees, but it was close, in the high nineties every day from Monday to Friday and stiflingly humid. The heat index hovered between 100 and 110 degrees. At night it was still hot. It was never not hot, and except for the bedrooms our house is not air-conditioned, so editing technical brochures, ferrying June around on public transportation, or cooking dinner I was often out of sorts and at times I envied Beth and the kids their air-conditioned office and camps. But I didn’t really envy Beth. She was stressed at work– she always is just back from vacation– but with all the Senate negotiations over confirmations of Secretary of Labor and to the National Labor Relations Board, it would have been a challenging week under any circumstances. Meanwhile, June was at basketball camp at a middle school where the air conditioning was varyingly effective. Some days I’d walk into the gym in the morning and feel a little relief from the heat, but it would only take a few minutes to realize it was still hot in there, just less hot than outside. At least they kept June’s age group inside all day except when they took them outside to run through the sprinklers. (The older kids played on the outside courts some of the time.) It was a very active camp, as you might expect. They had drills and played two full games of basketball almost every day. In the end, I think it wore her out, even though she enjoyed it most of the week. On Friday she said she felt tired and didn’t want to go to camp. I kept her home a couple hours to determine if she was sick, but when I decided she wasn’t, I took her to camp late, over her cranky protests. Her team did very well over the course of the week. Though we left in the middle of the last game so we could get to Noah’s performance on Friday and don’t know how it ended, they were 6 and 2 before that game in the running for the championship of their four-team division, the Big East (which for the first few days of camp June thought was the Biggies—she thought this was funny because the seven-to-nine year olds were the youngest division). Even Noah, who was at Round House Theatre Camp, which he’s attended since kindergarten and which he loves, was less satisfied with the experience than usual. He said it was fun, but he’s decided he’s just not that good at improv (this week’s theme). It makes some sense—thinking quick on his feet is not easy for him. Beth’s and my twenty-sixth anniversary was Monday, but the timing wasn’t good for celebrating, and we’d had dinner together at the beach with Mom and Sara babysitting, and twenty-six is kind of anti-climactic anyway so we exchanged gifts at dinner, ate the cupcakes I picked up that afternoon, and left it at that. These were the highlights of the week: the kids both started music lessons, Noah performed in an improv demonstration, and June had her second tennis lesson (her first was right before we left for the beach). We meant to have Noah take drum lessons from the teacher he’s had the past two summers but the teacher wasn’t returning my email or calling me back. This was not particularly surprising, as he was always a bit flaky, which we put up with because he had a way with Noah. Finally, I found out by contacting a music camp where the instructor used to teach that he’s left town. Needing to find someone who could give Noah lessons for the rest of the summer, I decided to try the new music school that opened up in Takoma a few months ago. 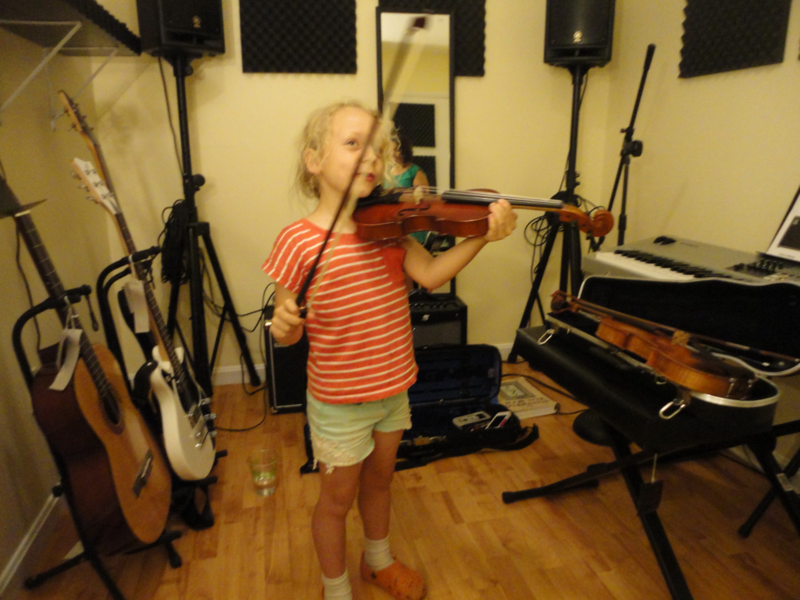 And while I was at it, I signed June up for violin lessons, because she’s been wanting to do that. Noah’s first lesson was Monday. I took him so I could meet the teacher, but I didn’t stay and I let him take the bus home himself. He self-dismissed from camp this week, too, which made my days considerably easier logistically. I was taking June to and from camp every day, and picked her up from a play date on Wednesday and took her to and from her violin lesson on Thursday. I was on at least four buses a day and one day (it was Monday before Noah was authorized to self-dismiss) I was on seven. Noah also helped me out by cooking dinner while June and I were at her violin lesson on Thursday. The violin lesson was much anticipated. June’s allowed two activities at a time. This spring I made an exception and let her do three because the running club at her school was practically free (it cost five dollars) and only met for four weeks. But running club, art class, and gymnastics were all long over and until recently we hadn’t signed her up for any summer lessons or classes. 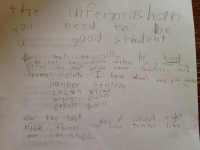 We sometimes don’t because she has day camps half the summer, and that seems like plenty to me, but she really wanted to start violin and tennis and she can be persuasive. I came in to observe the lesson. I won’t in the future because June says she would prefer I don’t—“It is a private lesson,” she emphasized to me. But the teacher encouraged me to come in and I was curious to see what would happen, so I did. The teacher showed her how to hold the violin and the bow, and she taught her the names of the strings. Then she had June practice playing each individual string first with the bow, and then plucking them with her fingers. 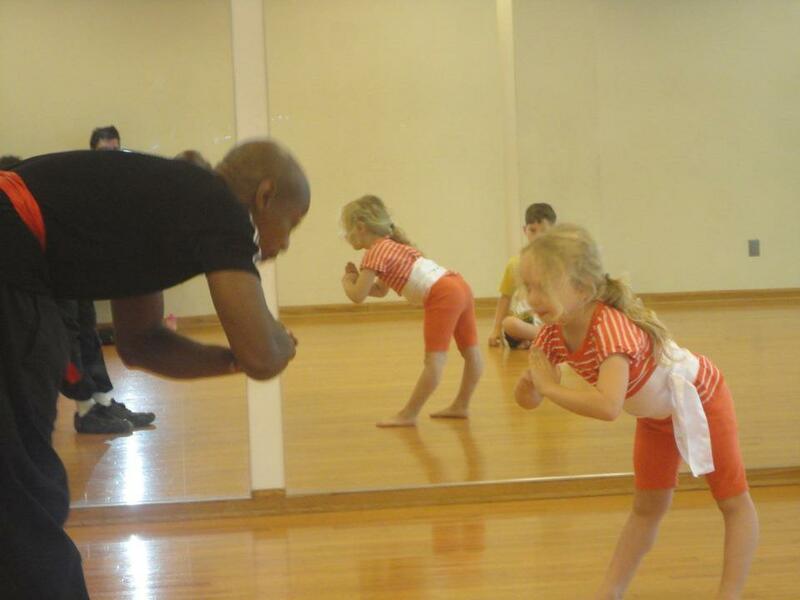 Next she taught her a simple rhythm, part of “Twinkle, Twinkle, Little Star” and had her play it. June seemed to like the teacher and was happy to be playing her instrument at the first lesson. 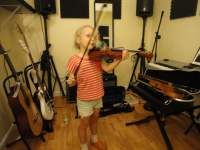 (We’d told her how when Noah took Suzuki violin lessons as a preschooler he had to practice how to stand and how to hold a fake violin for three months before he was allowed to have a real one.) June’s been good about practicing and is looking forward to her second lesson next week. Friday was Noah’s improv performance. Despite what he said, I thought he did fine. He wasn’t the best performer there but he was far from the worst. 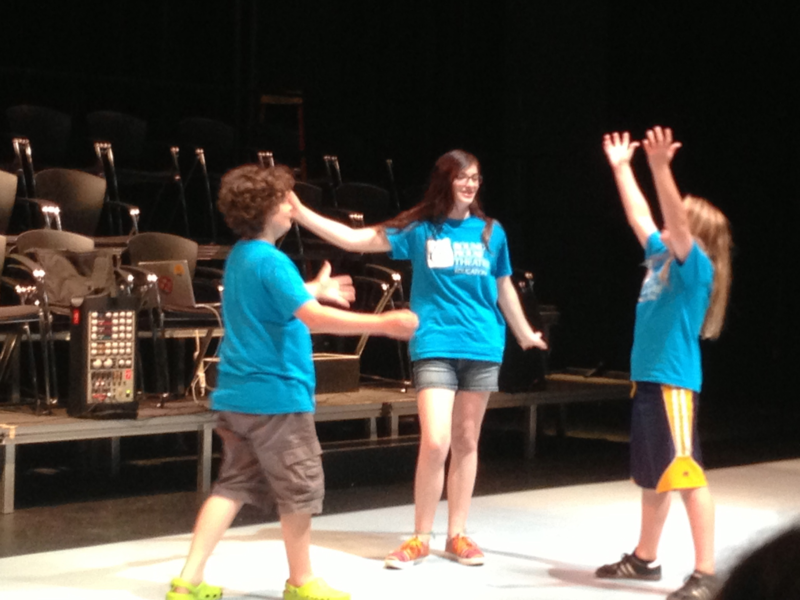 There were a number of different improv games. The one he played is called “Random Phrases.” The players are given a location and two items they need to incorporate into a skit (in this case, a big city, teeth and a lava lamp). On the floor are several folded pieces of paper. At any point in the action a character can pick up a piece of paper, read what it says and try to make the phrase make sense in context. Noah’s phrase was “my ears are full of cheese.” It was pretty entertaining. I also liked the skits that start in one film or television genre and then switch to another at a cue from a counselor. So a scene about two children losing their mother in the park can go from horror to war movie to romantic comedy to kung fu, etc. You get the idea. After the performance we stopped at the fountain so June could play in it. Noah’s decided he’s too old for this, though in this weather I would have done it in his shoes. (I considered going in myself, even though there seems to be an unwritten rule about adults not doing this. Why do kids get all the fun?) Next we had pizza at Zpizza and ice cream at Cold Stone. Saturday we had a very pleasant day. It was just a smidge cooler (mid-nineties) and better yet we spent the morning on a series of air-conditioned errands. Tennis was first. I missed seeing June’s first lesson because it was the morning we left for the beach and there was packing and chores to do. June missed the second lesson while we were at the beach, so this was the third one, for the group anyway. 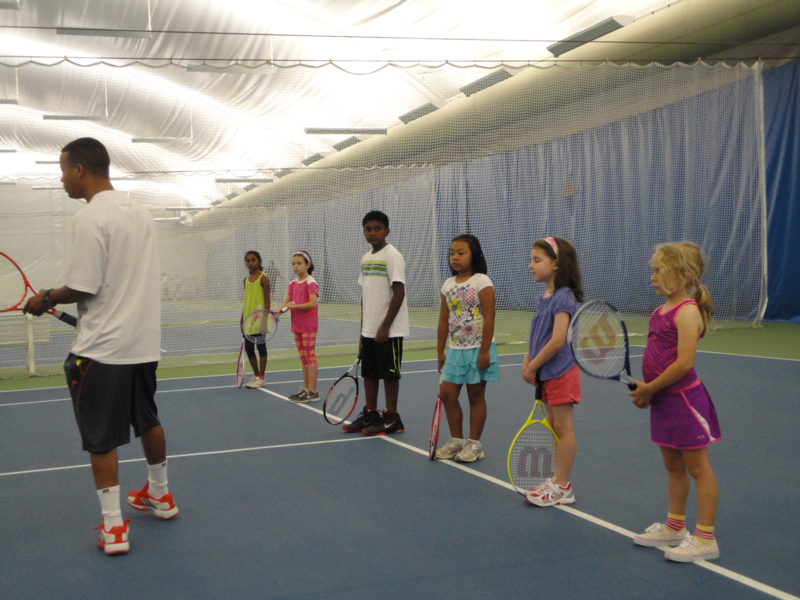 The lessons are held in a huge white tent, which contains ten tennis courts. Two had kids’ lessons in progress. Adults were playing games on the others. Most parents wait in the lobby and that’s what Beth did, but June didn’t seem to mind me and Noah coming to sit on the bench in her court and watch. Maybe that was because it wasn’t a private lesson. There were eight kids in the group, seven girls and one boy, aged seven to ten. They lined up and the instructor corrected the way they positioned their feet and held their racquets, for both forehand and backhand. (Later June said backhand was hardest because she missed the initial instruction for that.) Then he threw two or three tennis balls to each child and gave them pointers. Once everyone had two turns doing this, he sped things up, having the children run to where they were supposed to hit the ball and throwing it to them faster. Every now and then he’d stop to talk them through problems if they arose. Then he switched back to a slower pace and gave each child up to three tries to hit the ball. This time whenever a child hit the ball his or her turn was over. The kids’ skill levels were all over the map. June almost always hit the balls the instructor threw but only one went over the net. This put her pretty much in the middle, as some kids sent every ball sailing over the net, and others missed almost every ball. Toward the end of the lesson, June got a bit antsy and started playing air guitar with her racquet while she was in line waiting for her turn, but overall she seemed happy and engaged throughout the lesson. After a trip to the music store for new drumsticks and a drum key, Office Depot, and Starbucks we headed home. The kids and I watched Oliver! because that’s the musical June’s drama camp is doing next week. We went out for Mexican because I didn’t feel like cooking dinner. It was a nice way to end a hectic week. Sunday we had some welcome rain (just some sprinkles really but anything was welcome) and Noah had a three-hour orientation for band camp at the University of Maryland. In addition to percussion, he’s taking electives in world drumming, movie soundtracks, and technology. He was pleased with his assignments, though he’d hoped to get into conducting. Next week we’ll have two performances to attend—selected scenes from Oliver! and a band concert. I’m looking forward to it. Also, it’s supposed to be cooler, in the eighties most days. I think it could be a good week. I had a long week and Beth did, too. She had to work late on Thursday night and will be working this weekend, too. It seems like a good time to reflect on the past two weekends. They were very different from each other but each charming in its own way. Two weekends ago, Beth and I dropped the kids off at my mother and stepfather’s house, had pizza with them, and then and headed for a hotel in nearby Chester County. The original plan was for Mom and Jim to take the kids to Sesame Place on Saturday but that weekend was during the heat wave so after Mom and I conferred, she decided to take them to the Please Touch Museum (http://www.pleasetouchmuseum.org/) instead. Beth and I went out for ice cream at Friendly’s on our way to the hotel Friday night in order to establish a festive mood. Saturday we spent the morning at the Brandywine River Museum (http://www.brandywinemuseum.org/), a museum mostly dedicated the works of N.C., Andrew and Jamie Wyeth. I’ve been to this museum several times, mostly as a kid, but I’d never done the tour of N.C. Wyeth’s house and studio before (http://www.brandywinemuseum.org/ncstudio.html) probably because until 1994 there were Wyeths still living in the house, so that was fun. I especially liked seeing the studio. It’s a beautiful space with huge windows, a mural up on the wall and props all around. When you’re in there it feels as if N.C. has just stepped out, even though he died in 1945. In the museum I was particularly charmed by “In a Dream I Meet General Washington” (http://brandywine.doetech.net/Detlobjps.cfm?ParentListID=81915&ObjectID=1409117&rec_num=5#42) in the N.C. Wyeth collection. Click on the thumbnail. It will enlarge. I also liked “Evening at Kuerners” in the Andrew Wyeth Gallery (http://www.swoyersart.com/andrew_wyeth/kuerners.htm). It was nice to stroll through a museum at my own pace, having time to look at the art and actually read the captions as well. The countryside around Chadd’s Ford is pretty (there’s a reason those Wyeths settled here) and there were a number of parks and gardens nearby but the heat was still withering, so we spent Sunday morning reading, first in the room, then at a Starbucks (the local coffeehouse I wanted to try was closed Sundays) and then we had an early lunch (mushroom quiche for me) and headed back to Mom’s to pick up the kids. 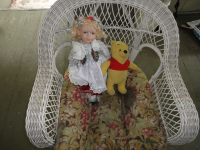 June showed us the German porcelain doll Mom bought her on her recent trip to Europe. Noah looked up some German names for her online and June named her Ursula. Ursula has zipped right past Ella and Violet and is now June’s favorite doll. We had a brief visit with my friend Pam before driving home. Pam and I went to high school together and now she lives in England and teaches at the University of Sussex. During the past year she has been living with her husband and two kids in her childhood home, and trying to sell it, as her parents have moved. We caught them a week before they were going to fly back to the U.K. We ate leftovers from the goodbye party they’d hosted the day before, chatted and watched the kids play in the sprinkler. And then we drove home. The following weekend we set aside both afternoons to take each of the kids to a movie alone. On Saturday, Noah went over to Sasha’s while we took June to see Winnie the Pooh. She loved it. She loved going to the movies with both moms and no brother. “It’s my special day,” she kept announcing. And she loved being in a big theater with her own bag of popcorn (she ate the whole thing!) and she loved the film itself. She kept talking excitedly about what was going on and laughing at the jokes. 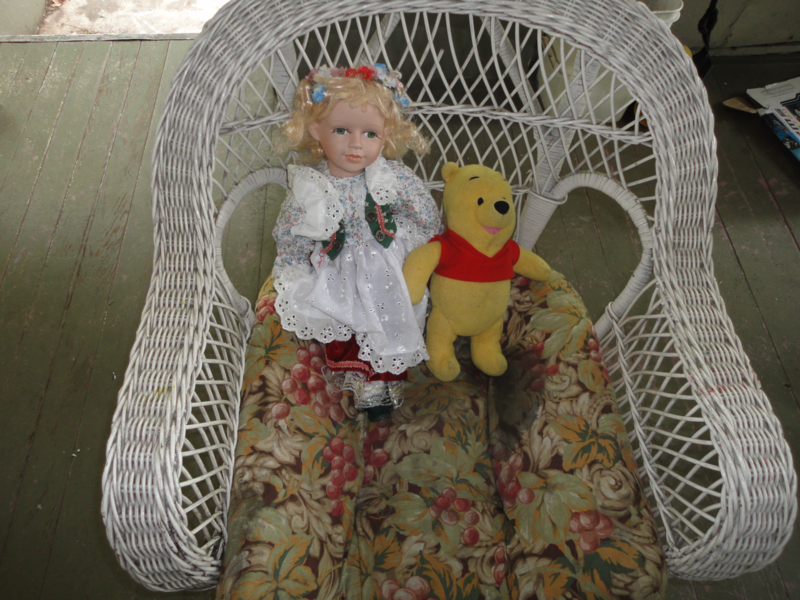 Her favorite part was when Pooh’s stuffing was coming out, she said later. A week later she seems to remember the plot pretty well. 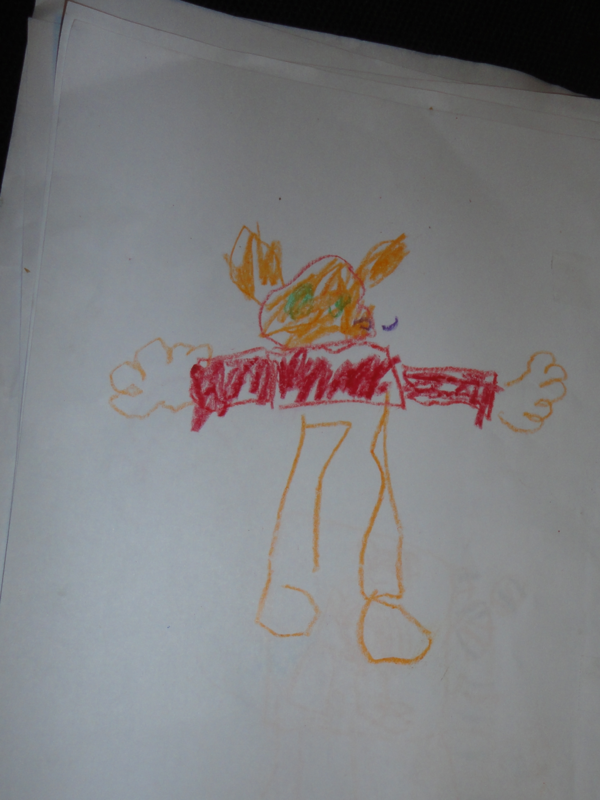 Today she drew a series of pictures of Pooh, Piglet, Tigger, Kanga, Roo and the Backson in various scenes from the movie and taped them together into a book. It’s so hard to find an innocent kids’ movie that’s not too scary or full of snarky jokes these days that I really appreciated it. And I think a lot of parents did, too. Beth said it’s doing very well at the box office. Among my own circle of friends, the Mallard Duck’s mom recently wrote a blog post about seeing Winnie the Pooh with her daughter that’s worth reading. She captured exactly what I felt about it (http://mimi37.blogspot.com/). Also, I realize this is a bit meta, because she links to me in this post, but bear with me and read it. 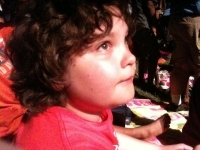 Sunday, we left June with a sitter and went to see Time Bandits at AFI (http://www.afi.com/) with Noah. Noah didn’t exclaim about it being his special day, but still it was nice to have the chance to focus on him without the competing chatter of his little sister. I saw Time Bandits thirty years ago when it came out in theaters at least twice. I remembered loving it but not a lot of detail about the plot. I was just a little nervous about it for Noah because of the fuzziness of my memory and because I was fourteen, and not ten, when I saw it. It was rated PG, but it was made in the days before PG-13, when that rating covered a wider range of material. As it turned out, it was just at his level in terms of action. The violence was comparable to the Chronicles of Narnia films we’ve watched at home and I think the very mild sexual innuendo probably went over his head. He loved most of the humor. I think he missed a few jokes, but the line “So that’s what an invisible barrier looks like,” made him guffaw and he also liked the part where Evil blows up a one of his minions for asking an impertinent question and then concedes, “Good question,” and goes on to answer it. I don’t think Noah’s ready for Monty Python yet ( it’s both racier and gorier) but it made me look forward to when he is. As different as the weekends were, I think what I liked about them was the same thing. We were split up in unusual combinations. Beth and I don’t make enough time for dates and alone time, or rather, we resolve to and then we do and I really enjoy it and then we slip out of the habit. That’s the pattern, so a weekend alone was a nice luxury. Thanks, Mom and Jim! We also don’t have a lot of two-parent-one-child time with either of the kids and I think that’s important, too. As easy as it is to get bogged down in the hassles of day to day life, every so often I find myself thinking of the light coming through N.C. Wyeth’s studio windows and I know Winnie the Pooh’s adventure with the Backson is still reverberating in June’s imagination. I think these two weekends did us all good. Somehow I don’t feel like breaking out the confetti and champagne glasses. This afternoon, around 1:15, as I was putting June down for her nap, I noticed it was very dark in the room and I could see tree branches whipping around outside in the wind. At 2:00 p.m., just as I was getting ready to pick up Noah at drama camp, it started to rain. June, who had been awakened from her nap, snuggled sleepily against my chest as we waited at the bus stop. The rain felt cool on my bare toes and made a pleasant tapping sound on the top of the umbrella. By the time we arrived in Silver Spring, it had stopped. It was still windy so it was hard to tell how much cooler it really was. We were a bit early so we headed for the turf. For the first time ever, June and I were the only people there. I watched June wander around its eerily empty expanse. Back home, I checked the thermometer. Inside it was 88 degrees; outside 84 degrees. Noah insisted on staying inside and playing computer games in the study, the hottest room in the house (its windows are painted shut). Meanwhile, I changed June into her bathing suit, made myself a glass of lemonade and we hit the back yard. She amused herself climbing on top of the sandbox as I filled the wading pool. After fifteen minutes or so, Noah appeared in the back door, wanting to know if I’d read Through the Looking Glass to him. I read the chapter in which the Queen turns into a sheep and started the Humpty Dumpty chapter, soaking my feet in the pool. The air was warm, but not too hot. Not too hot at all. I could get used to this. Definition: These are the hottest and most unhealthy days of the year. Also known as Canicular Days, the name derives from the Dog Star, Sirius. The traditional timing of Dog Days is the 40 days beginning July 3 and ending August 11, coinciding with the heliacal (at sunrise) rising of Sirius. Last week while walking to the grocery store to restock on orange juice and ice cream, Noah and I noticed the tar used to repair the spider’s web of cracks in the street was darker than usual as it softened in the sun. I stuck my finger into it to show him how it gave. He tried it, too, marveling that the street was actually melting before our eyes. The ice in my iced tea vanishes before I can finish the glass. Unless June’s been bathed in the past two hours, her hair smells vinegary with sweat. Today’s high is 98 degrees. Has it been like this a week? Two weeks? Surely not, but it feels like it. It doesn’t get much below the high 70s at night any more so by 7:30 one recent morning as we were sitting at the breakfast table, I realized it was already too hot. For days and days now it’s never not been too hot. Beth escaped for several days on a business trip to Chicago, where she reports it’s just as hot, but not nearly as humid. All Noah’s play dates this summer have ended with Noah and his guest spraying each other with the garden hose, but when Maxine came over last Friday, this activity went on and on until the whole parched yard, the prickly grass, the patio furniture, the silver maple’s trunk and the rough unpainted fence planks were all dripping. Why doesn’t it rain here, I thought, a good hard rain that would clean out this awful, heavy, sticky air? I’ve no objection. Contrariwise. We are just past the midpoint of summer meteorologically speaking. Still, I can the see the end of summer from here. It gets dark earlier in the evenings and stays dark later in the mornings. The pink day lilies, the last flowers in our front yard’s procession that starts with crocuses in February or March, are in bloom, and some of them are already wilted. Noah started his last camp (drama) yesterday. School starts in less than three weeks. And as if to drive in the point, we received a catalog of Halloween costumes in the mail today. It’s been a good summer so far. June is talking up a storm, sometimes stringing together two word phrases such as “No apple!” “Mo dis” (More of this please) or “Go walk” (Let’s go for a walk!). And she recently started sleeping apart from us in a toddler bed for naps and for the first few hours of the night. Noah started swimming lessons at the Y a couple weeks ago and is doing well in them. His tantrums, which surprised us so much this spring, ended abruptly a week or two after school let out. We haven’t had a single complaint about his behavior at any of the camps he’s attended, only warm words from the counselors about how funny, smart, sweet and enthusiastic he is. 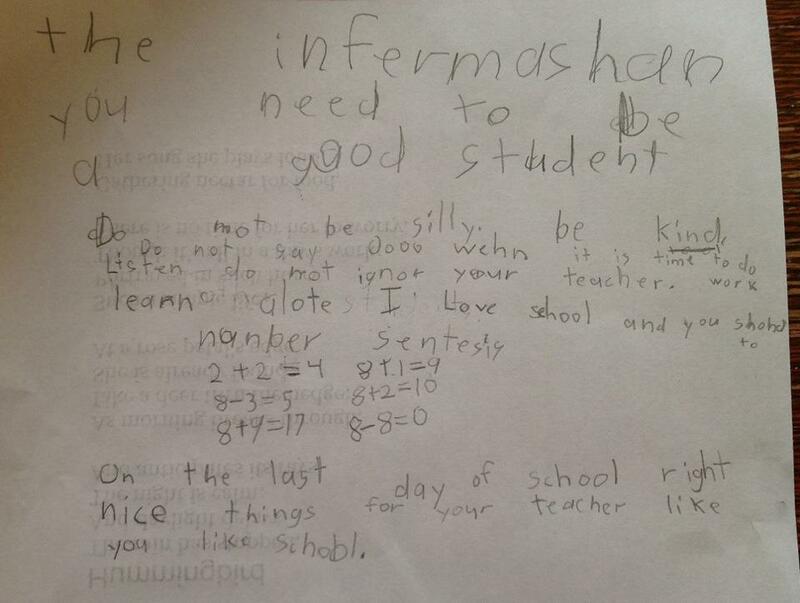 It makes me hopeful about first grade. Meanwhile we still have a few weeks before the school bus stops at our corner, a few more weeks to splash in the wading pool in the afternoons and eat popsicles on the porch in the evenings. A few more weeks to cajole Noah into finishing the mounds of summer homework he still has to complete. (And what’s up with that? I didn’t have summer homework until middle school.) We’ll spend the last week of his summer vacation at the beach. And according to the weather page in today’s paper, it’s ten degrees cooler there.